Visit the D-Day Landing Beaches with a 12-hour Normandy D-Day Tour from Paris. The tour makes stops at Pointe du Hoc, the American Cemetery located above Omaha Beach, the village of Arromanches, the German artillery battery at Longue-sur-Mer and the Caen Memorial Museum. This tour will leave you with lasting impressions of the Invasion of Normandy that took place on June 6, 1944. Tour Stops: Pointe du Hoc, the American Cemetery at Colleville-sur-Mer, the village of Arromanches, the German artillery battery at Longue-sur-Mer, and the Caen Memorial Museum. Tour Dates: Daily April 1st through October 31st, except Sundays. From November through March 31st, tours are Tuesday, Thursday, Saturday. No tours in January. No tours on May 1st. No tours on June 4, 5, 6, 7, 8, November 1st, December 24, 25, 31. Meals: Meals are not included are not included in the tour price, but you will stop in a town where there are restaurants to have lunch on your own. Pointe du Hoc, where Colonel James Earl Rudder led an assault by elements of the American Second Ranger Battalion on a German gun battery on the morning of D-Day. 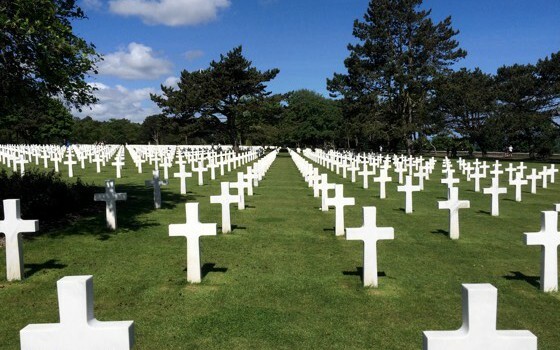 The American Cemetery at Coleville-sur-Mer – the cemetery is located directly above Omaha Beach. Village of Arromanches – the village is situated at the location of Gold Beach, one of the beaches where British troops landed on D-Day. Caen Memorial Museum – built on the site of an old bunker, the Caen Memorial provides a thought-provoking meditation on the evils of war, the importance of learning from past failures and successes, and the difficulty but necessity of finding lasting peace. The driver guide will return you to your Paris hotel or apartment after the tour.